Completed in 1991, Zermattitis, was the first of a planned trilogy of books written by Tony Ashton. Now in conjunction with Tony’s widow, it is being publishing for the first time. Painstakingly transcribed from Tony's hand written manuscript, it is written in his inimitable style and will have your sides splitting with laughter throughout. 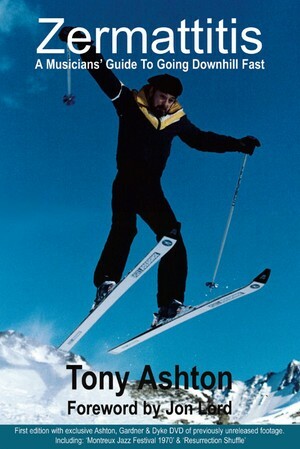 Zermattitis isn’t a straightforward autobiography, it’s a collection of Tony’s memoirs and short stories that starts with his love affair with Zermatt in Switzerland, which he first visited with Ashton Gardner & Dyke, and which gave him the title for the book. Other stories include his escapades on the road with many including Eric Clapton, George Harrison, Alice Cooper, Deep Purple; Paice Ashton Lord, the GasTank TV series, and even the chapter on his bankruptcy is funnier than it has any right to be. Tony Ashton, singer, musician and artist extraordinaire, who sadly died in 2001, was one of those unique figures who garnered more respect and admiration within the business than most of his contemporaries. the album, Malice in Wonderland. However his enduring popularity also rests on his conviviality, sense of humour and flair for showmanship. This limited edition hardback comes with a DVD of rare and previously unreleased Ashton Gardner & Dyke film featuring a live performance from Montreux Jazz Festival 1970, a rare promo film of The Ballad Of The Remo Four, Resurrection Shuffle TV broadcast, as well as Tony's performance of his homage to John Lennon, The Big Freedom Dance filmed in part, in 1996, by Chris Evans.